Apply for a Campus Oil Fuel Card today and start using it in any of 790 Campus and Topaz service stations nationwide. Your monthly invoices conveniently summarise your VAT which you can use for VAT reclaim purposes. 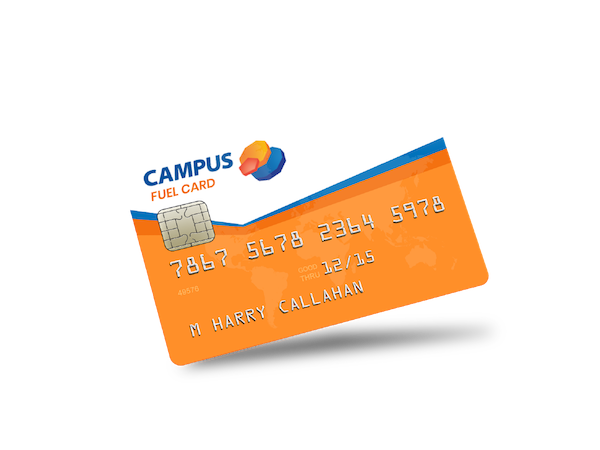 Campus fuel cards are widely accepted across Ireland. Find your local forecourt on interactive site map. Fuel cards enable a convenient, secure and cost-effective method for paying for petrol or diesel fuel at any forecourt in our service station network across Ireland. With dedicated 24/7 online account management, Campus Fuel Cards allow you to monitor and track your fuel expenses. With these services, the complex process of tracking your fuel expenditure becomes automated. This saves you time, and as the old adage goes: time is money. We all know that this has never been more true! Security is a primary concern of many business today, and Campus Fuel Cards provide many security features to ensure that your accounts are safe. Utilising the same chip and pin technology that is used by standard modern banking cards, fuel cards ensure that every transaction is an authorised one. You never need to worry about your fuel card being cloned, or used fraudulently in other undesired breaches of you security. This way you can be sure that with a Campus Fuel Card your accounts are protected from the troublesome hassle of fraud.